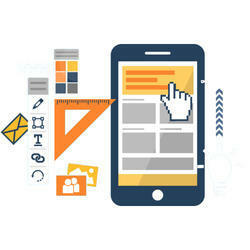 At Fame Easy we design fully scalable and device adapted website for mobile phones. Mobile websites designed by us are fully interactive, full featured, comfortable to use and are easily navigable from the device you use to browse. So, don't let your customers go away get mobile website and serve your customers better. Undoubtedly, the introduction of smart hand handled device has not only brought the big change in the picture as we seek information but also the way we look, choose and shop for ourselves. In the world of Smart phones and tablets, everyone visits a website through their mobiles as it provides easy access to information on the go. Keeping this fact in mind, we design mobile friendly websites for you which attracts approx 70% more traffic to your website. Your clients are no longer willing to be tethered to their computers. Chances are they're already using their Smartphone to check out your business. The future of the Internet is Mobile: it's currently the fastest-growing industry in the world. In fact, the average user spends 9% more time using mobile apps than the Internet. Stay ahead of the crowd. Our mobile site are designed for optimal brunt, crumbling convention and creating demand for your business.